To commemorate the 50th Anniversary of the Wilderness Act, the Smithsonian's National Museum of Natural History is running a photo contest to determine which images will be featured in a special exhibition. Here are some of our favorites. 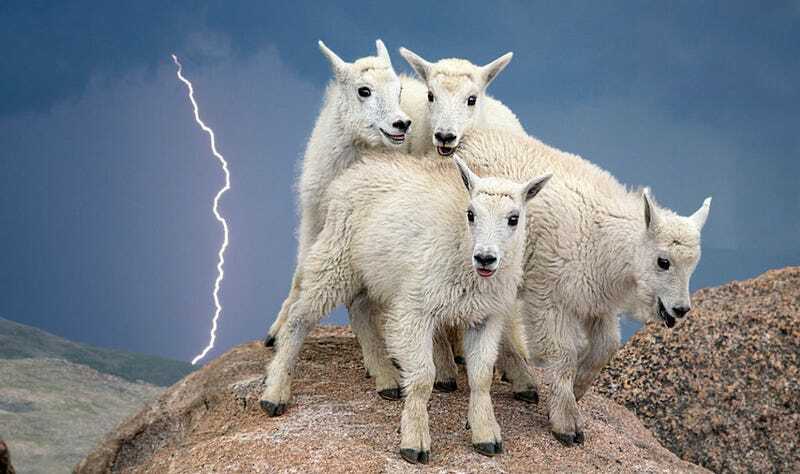 Top image: A herd of mountain goats huddle together on top of Mount Evans, Colorado during a lightning storm. Credit: Verdon Tomajko, Superior, Colorado, USA. The exhibition, called Wilderness Forever: 50 Years of Protecting America's Wild Places, opened on September 3rd and will run through summer 2015. In conjunction with the opening, Smithsonian has launched a photo contest and an exhibition website at Wilderness.Smithsonian. ...established the National Wilderness Preservation System that represents America's most wild and pristine federally protected lands. Today, these lands encompass 758 wilderness areas covering more than 109 million acres in 44 states and Puerto Rico. Together, they represent the largest, most highly protected body of wild lands in the country. The winning images, which were selected from a pool of 5,000 entries, were captured by professionals, students, and amateur photographers. Each month, visitors to the website will be able to view all 60 photo finalists and vote to select their favorite. The photo with the most votes will be featured daily and monthly. Here are a few that caught our eye. Samuel Feron, Noisy-le Sec, France: "Due to the strong wind, these light holes were quick to move. It evoked an Aurora Borealis effect of moving lights." Thomas Goebel, age 18, Jensen Beach, Florida: "This gem is one that you must see for yourself." Tracy Arm-Ford's Terror Wilderness in Alaska. By Irene Owsley, Potomac, Maryland: "The setting was primeval, exuding the essence of self-willed landscape." Joe LeFevre, Oswego, New York: "It's important to protect our dark sky wilderness areas, away from light pollution, so everyone can enjoy unobstructed views into the heavens." Richard Hebhardt, Juneau, Alaska: "The stark contrast between the hiker's diminutiveness and the size of the dune was a scene I had to shoot." Denali Wilderness, Denali National Park and Preserve in Alaska. By Dee Ann Pederson, Houston, Texas: "After spending more than an hour watching these two rousting about, darting beneath and around the vibrant dwarf birch and tantalizing one another, it is easy to understand where the dance term 'the fox trot' originated." Katmai Wilderness, Katmai National Park and Preserve in Alaska. By Robert Amoruso, Orlando, Florida: "I created several images as the bear rose and then retreated to the far shore. This shot, with the bear gazing directly at me, was the best." Bosque del Apache Wilderness in New Mexico. By Diane McAllister, Reno, Nevada: "After an hour, this pair was among the first to fly in. They appear to be perfect partners in a synchronized flight dance." Denali Wilderness in Alaska. By Tim Aiken, age 18, Stanford, California: "The monochromatic clouds and mountains were nicely juxtaposed by the bright fall colors displayed in the alpine plants." Mount Baker Wilderness in Washington. By Ethan Welty, Boulder, Colorado: "Contrary to all appearances, my leaping friend Yoav — emboldened by the presence of a camera — made the jump to dry land." Lava Beds Wilderness in California. By David E. Bunnell, Angels Camp, California: "Just before I captured this image, a brilliant sunbeam pierced the small opening and produced the hotspot on the wall." Glacier Bay Wilderness Area in Alaska. By David Bahr, Nederland, Colorado: "Progress was slow, but when the bird finally arrived at the rocky shore, it was able to hop out of the water carrying its lunch. Although stunned and soaking wet, the eagle had somehow managed to hang onto its meal." Cypress Swamp, Marjory Stoneman Douglas Wilderness in Florida. By Bill Lea, Franklin, North Carolina: "The stark quiet combined with the stoic tree trunks created a cathedral-like atmosphere — it was definitely a spiritual journey." Marjory Stoneman Douglas Wilderness in Florida. By Jenna Van Kley, age 16, Powell, Ohio: "I framed the alligator from the side to highlight its intense look, the leather-like texture of its skin, and the bony ridges on its back." Ethan Welty, Boulder, Colorado: "People interacting with the landscapes of the wilderness provide an endless supply of new photographic opportunities." All images and captions via Smithsonian.